Saint Nicholas Day or the Feast of Saint Nicholas is a Christian Festival celebrated every December in honor of Saint Nicholas, a saint revered for his extreme generosity to children. 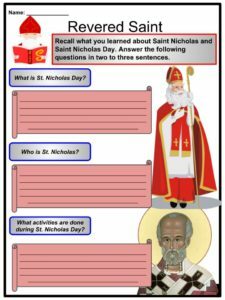 See the fact file below for more information on the Saint Nicholas Day or alternatively, you can download our 22-page Saint Nicholas Day worksheet pack to utilise within the classroom or home environment. St. Nicholas is the patron saint of children, sailors, merchants, thieves, and pawnbrokers. He was of Greek descent and was born during the third century in the village of Patara. He lived most of his life in the nearby town of Myra (both of which were part Lycia, present-day Turkey). The name “Nicholas” means “people’s victory” in Greek. He was often referred to as “boy bishop”, becoming a bishop at the age of only 30 years. He was the Roman Catholic Bishop of Myra during a time when Christians were persecuted by the Romans. He was jailed by the Roman Emperor Diocletian for seven years until he was freed when Emperor Constantine, the first Christian Emperor, issued the Edict of Milan in 313. 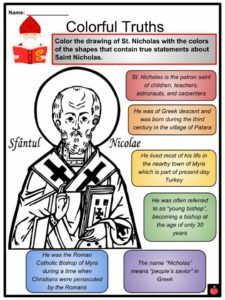 St. Nicholas attended the first Council of Nicaea in 325. 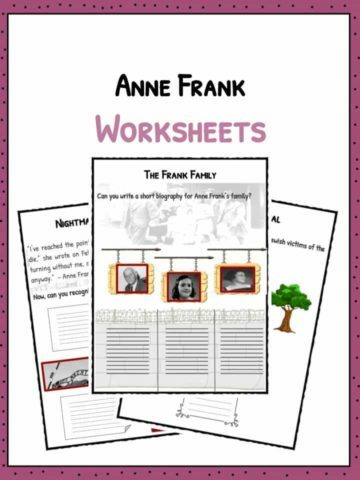 According to legend, he helped three girls who couldn’t get married and were about to be sold by their fathers to slavery due to poverty by throwing purses of gold through their window for three consecutive nights. Legend also says that the saint brought back to life three children who were chopped by a butcher to cure and sell as ham. There are records of him intervening in the execution of three innocent men who were condemned to be executed by a corrupt magistrate because of a bribe. St. Nicholas’ remains were buried in Bari where a shrine was built for him. However, his bones were stolen by Venetian sailors. His remains are now in the church of St. Nicholas on Lido, Venice, Italy. He died at age 73 on the 3rd of December, 343. 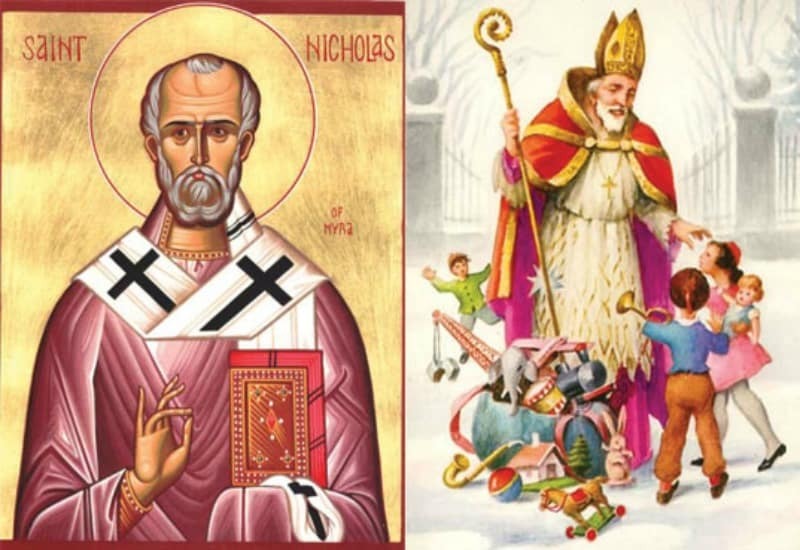 Research on the remains of St. Nicholas in 2005 shows that he was five feet tall and that he had a broken nose. A pure liquid called the Manna of St. Nicholas has been known to flow from his bones since his death 17 centuries ago. The Manna is collected by a Dominican priest every 9th of May to bless Christians. The legend of Santa Claus was based on the life of St. Nicholas. The name “Santa Claus” came from “Sinterklaas”, the Dutch name for St. Nicholas. 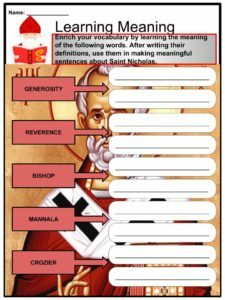 St. Nicholas became an important figure in Holland, his influence withstanding the Reformation in the 1500s, a time when honoring saints was shied away from. 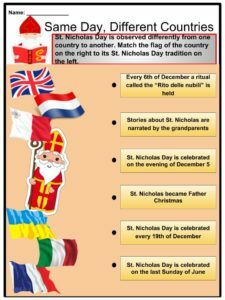 The Dutch celebrated the feast day of St. Nicholas on the 6th of December. In several European countries that celebrate St. Nicholas Day, the traditional time of giving presents to children is during the eve of the holiday, instead of Christmas Day. Oranges are traditionally given to children in Holland, supposedly coming from Sinterklaas. These oranges often came in three, symbolizing the three bags of gold St. Nicholas gave in the legend where he helped three girls avoid slavery. Children receive their gifts in shoes, because the saint used to leave gifts in children’s shoes. 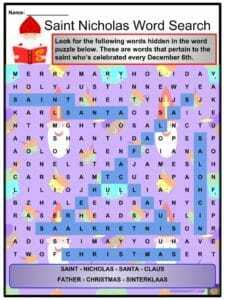 This is the act from which the idea of Christmas stockings originated. Typically, families gather during St. Nicholas day and celebrate with a feast. In some families, the dad will dress up as St. Nicholas on the eve of the festival. In the Netherlands, the day of St. Nicholas is celebrated on the evening of December 5 when people who were dressed up as Sinterklaas give presents to children. In Eastern Europe, children leave their shoes by the windowsill on the evening of December 5 and would go to sleep hoping to wake up to shoes filled with gifts. In France, it has been a practice that the whole family awaits the arrival of the Saint while listening to stories about St. Nicholas narrated by the grandparents. Bakeries bake spiced gingerbread biscuits and mannala, a brioche in the shape of a saint, in celebration of St. Nicholas Day. In Central Europe, children place a boot called the Nikolaus boot outside the front door on the night of December 5. If the children are good and polite during the year, they wake up to a boot filled with sweets and goodies. If they are not, they wake up to a boot with a stick. Italy observes a tradition every 6th of December where a ritual called the “Rito delle nubili” is held for unmarried women who wish to find a husband. In some Italian provinces, they celebrate St. Nicholas Day by giving gifts to children and also by hosting a fair called “Fiera di San Nicolo”. In Malta, the feast day of the saint is celebrated during the last Sunday of June, while in Portugal, it is celebrated with a series of festivities that occur from November 29 to December 7. Slavic countries celebrate the day of St. Nicholas every 19th of December by fasting from animal and dairy products. 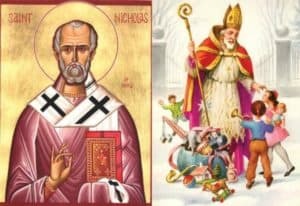 It was the Dutch who brought the legend of St. Nicholas to America where he became part of the Christmas holiday over the centuries, and is now the Santa Claus we know today. In North America, chocolate coins are placed in kids’ Christmas stockings, symbolizing the gold coins the saint used to give away. Candy canes are a staple Christmas decoration in America. They are based on the bishop’s staff of St. Nicholas called the crozier. In the United Kingdom, St. Nicholas became known as Father Christmas. 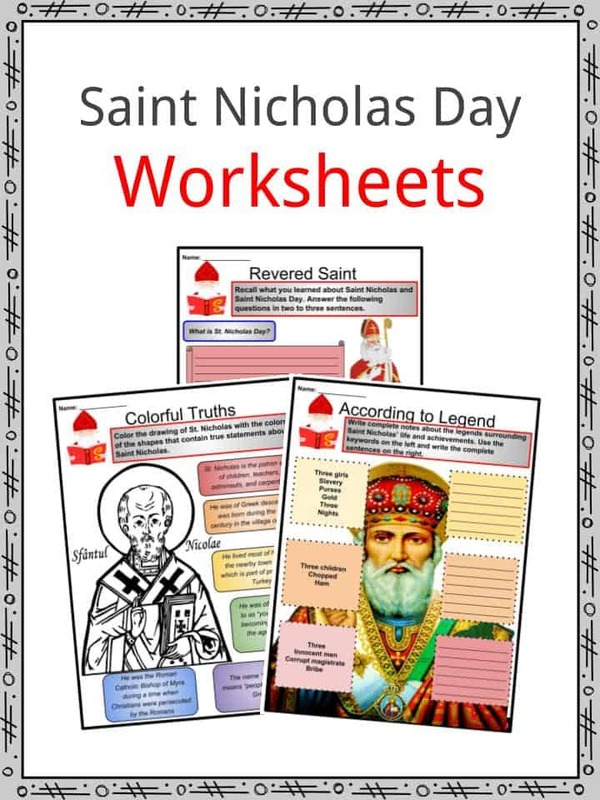 This is a fantastic bundle which includes everything you need to know about Saint Nicholas Day across 22 in-depth pages. 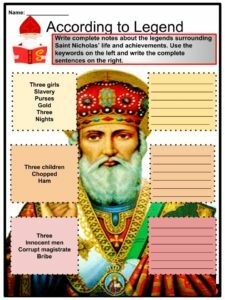 These are ready-to-use Saint Nicholas Day worksheets that are perfect for teaching students about the Saint Nicholas Day or the Feast of Saint Nicholas which is a Christian Festival celebrated every December in honor of Saint Nicholas, a saint revered for his extreme generosity to children.